Medium and large free range eggs for sale! Our ladies lead very happy lives foraging grass, clover and insects in our backyard. We supplement their grazing with all-natural grain and do not offer them medicated feed or growth hormones. $2 for a half dozen eggs chosen randomly from Ameraucana, Barred Rock, Golden Comet and Speckled Sussex breeds. For those of you interested in raising your own chickens or perhaps adding birds to your existing flock, our Speckled Sussex rooster, Lord Tyrian, would be happy to offer his services. Incubation is 21-23 days. $3 straight run chicks or $5 sexed at 4 weeks. Introductory offer for all Skidaway campus employees, friends and family — 50% off all services for the first visit. We are a new full-service salon. All our stylists have more than 20 years experience. Take advantage of our offer if you are looking for a modern, relaxed and talented atmosphere. We are very competitively priced. For an appointment or any questions, please don’t hesitate to call us. 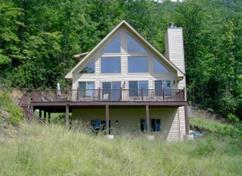 This large, chalet-style vacation home is located on Cold Mountain (of book and movie fame), near Waynesville, NC. It is very spacious and has a fantastic view. It is an excellent location for a multi-family get together.The home is owned by Mike Sullivan’s sister-in-law, Barbara Bishop. For further information, contact Mike Sullivan at 484-2622 and/or go to http://www.vrbo.com/102183 for additional information, including photos, rates and availability. The University of Georgia Marine Extension (UGA MAREX) completed the design, fabrication and installation of three new marine debris exhibits currently housed at UGA MAREX on Skidaway Island, Tybee Island Marine Science Center on Tybee Island and the Georgia Sea Turtle Center on Jekyll Island. 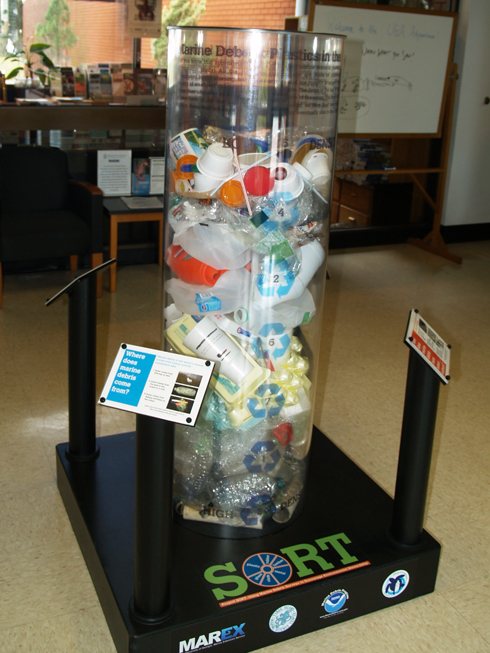 The exhibits, funded by the NOAA Marine Debris Program, are one component to the year-long project, Project SORT: Using Marine Debris Surveys to Encourage Environmental Stewardship. 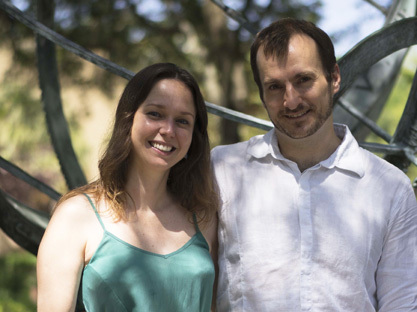 Skidaway Institute scientists Thais Bittar and Aron Stubbins were married in a small, private ceremony in Troup Square in downtown Savannah on May 8. The couple will follow-up with a ceremony in Brazil later in the summer. The annual Green Eggs and Sand Horseshoe Crab Teacher Workshop was held May 2-4. It was co-hosted by the University of Georgia Marine Extension Service and the Sapelo Island National Estuarine Research Reserve. Twenty nine educators from South Carolina and Georgia came together to learn about and better understand the issues, science, and management of the horseshoe crab/shorebird phenomenon. The highlight of the workshop was viewing spawning horseshoe crabs and migratory shorebirds in the field. 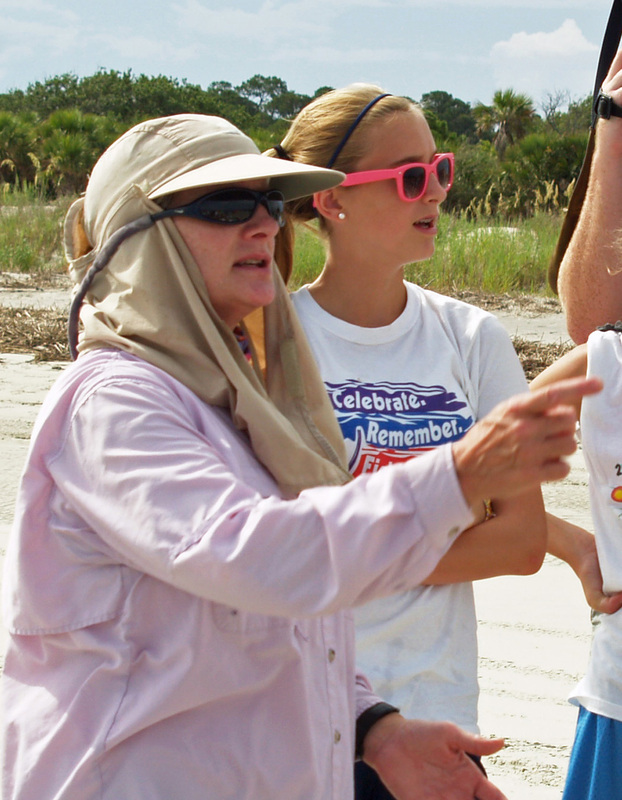 The workshop funded in part by Sapelo Island National Research Reserve provided a unique environmental education experience for teachers and a curriculum package that teachers can take back to their classroom. 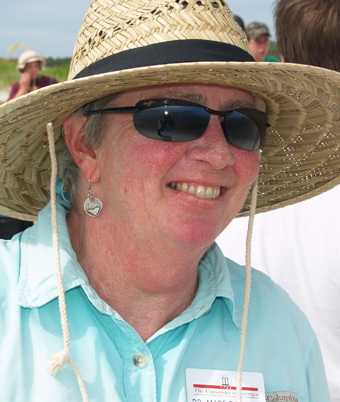 Maryellen Timmons has been elected the new Chair of the Awards committee for National Marine Educator’s Association. Dr. Timmons presentation abstract “Fish bits and tidbits” was accepted for presentation at the National Marine Educators Association (NMEA) annual meeting in Annapolis, MD., July 2014 where she will represent MAREX and Georgia Sea Grant. Also, Mare has received notice that her abstract “Mentoring and evaluation of undergraduates, interns, and K-12 teachers/students” was accepted for The Mentoring Conference, hosted by the University of New Mexico scheduled for October 2014. She will be speaking at the meeting, presenting a poster, and submitting a manuscript for the meeting proceedings. Dodie Sanders presented at the Annual Environmental Education Alliance of Georgia Conference on Friday, March 28th at Rock Eagle 4-H Center. The one hour presentation, “Project SORT: Using Marine Debris Surveys to Engage, Educate and Encourage Environmental Stewardship”, allowed 20 educators to learn about programs that effectively engage and educate the public about estuaries and the ocean and the impacts that marine debris can have on these systems. Participants learned how to set up a marine debris survey site in their community and discovered how marine debris shoreline surveys can serve as a tool to educate citizens on current global issues. Angela Bliss was an invited presenter for the third year at the third annual STEMposium held at Ft. Stewart on April 4th. She taught over more than 120 firsts and fifth graders about buoys’ construction and the nature of science while engaging them in STEM based disciplines. Students created buoyant structures and tested its maximum payload capacity. Angela was also invited to assist the Fowler Drive Science Club students drive in Athens, GA and present a program to their ROVes (remotely operated vehicles for elementary students) on April 8th at the school’s science night. Ten of the students were able to present their work that night reaching more than 150 parents, students (elementary through high), and school staff and personnel. 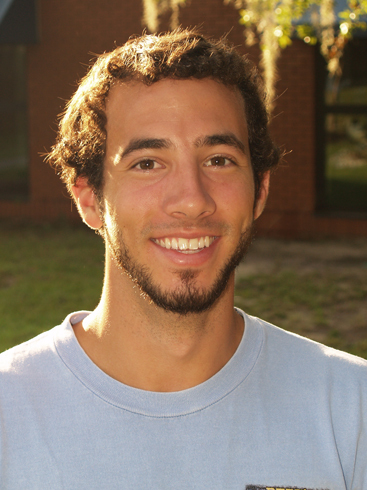 Intern Nick DeProspero participated in STEM Academy’s Georgia STEM Day in Savannah. Nick educated 531 middle school students on the numerous different job options that are associated with the marine sciences in relation to how they were directly associated with science, technology, engineering and math. 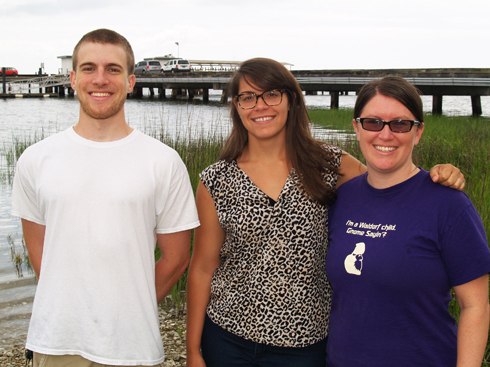 The Byers lab is gearing up for summer, growing from the three of us over the winter to a team of three graduate students, Alyssa Gehman, Jenna Malek and Linsey Haram, and two technicians, Kaitlin Kinney and Aaron Penn. In addition we have a great team of interns that will each be working with us. All are UGA undergraduates: Sarah Perry, Morgan Walker, Justyna Syzmonik, Jessica Story, Tim Montgomery, Allison Capper, Rachel Usher, and Lucas Montouchet. Jeb Byers is here for a month, helping out with his students’ projects and tying up loose ends on some projects that have been going in full force out of SKIO over the last several years. These projects include work on oyster reefs, invasive seaweed, and marine parasites. Alyssa is working with parasites and their hosts that live in the marshes of coastal Georgia. 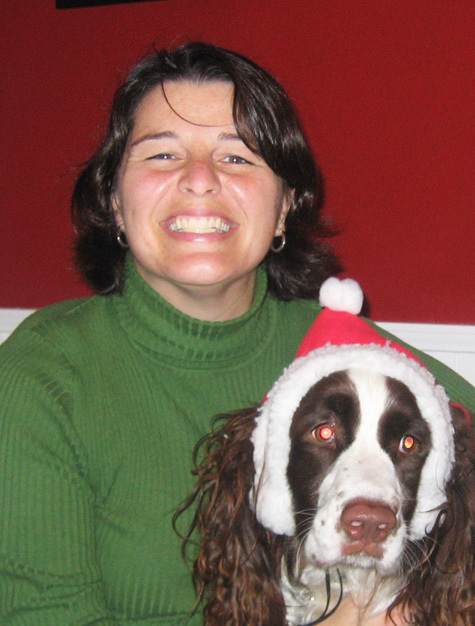 She is interested in how host-parasite interactions will change with the increasing temperatures that will come with climate change. The parasite, Loxothylacus panopaei, is a barnacle that settles on its crab host, Eurypanopeus depressus, injects itself into the crab as a small worm-like animal which then grows tendrils that go through the crabs internal organs. When the parasite has established its adult infection the host is then castrated, and if it happens to be male it will be morphologically changed into a female (female crabs are also castrated, but they get to stay female). Once established the crab will live the rest of its life only producing parasite offspring. Alyssa will be working with this system to see whether parasites have thermal upper limit on reproduction, like their free-living counterparts. Linsey studies the effects of the invasive seaweed, Gracilaria vermiculophylla, on salt marsh communities. The seaweed can be found in mats attached to native tubeworms in estuaries from the Southeast to New England. This summer, she and technician, Kaitlin Kinney, will investigate how decomposing G. vermiculophylla alters the biogeochemical characteristics of our mudflats. With the help of an REU student, Linsey will also investigate which invertebrate and fish species consume live G. vermiculophylla, if any. Jenna is studying how environmental factors influence parasite infections and immune response in the Eastern oyster, Crassostrea virginica. For the last 2 summers she has conducted field experiments in Romerly Creek Marsh looking for effects of air temperature and predators on patterns of the oyster parasites Perkinsus marinus (casuese Dermo disease) and Haplosporidium nelsoni (causes MSX). The results of these experiments were largely inconclusive, leading to the development of an extensive laboratory project this summer trying to pinpoint the threshold of air temperature necessary to cause biologically significant changes in parasite infection incidence and severity, as well as immune response. Oysters collected from Priest Landing will be exposed to air temperature treatments ranging from 27-53 Celsius for 4.5 hrs each day to simulate intertidal exposure. Mortality, growth, and infection status will be determined for each individual oyster and a subsample of oysters will be tested for immune response. Her hope is to determine where along the air temperature gradient changes begin to occur, which will help to interpret her previous research and may have important implications for future restoration and conservation efforts in the face of climate change.